Minit analyzes concrete data form IT systems to discover how business processes flow in reality. Minit discovers business processes by examining the electronic footprints (event logs) left in various IT systems. From this unstructured data Minit automatically creates a process model to enable in-depth analysis. Create a business process model at a fraction of the time and cost necessary in the traditional way. Automated business process discovery also reduces human errors in the analysis. Process maps with all the nuances of the process, statistical information, variants, process exceptions, unusual transactions, bottlenecks, deviations, and potential risks in processes. Discover processes without prior knowledge or specifying a process model. Process maps are created from data logged during normal execution of the process. Bridge the “white space,” the process knowledge gap that exists between various systems, departments and functions and at the edges of processes. Process documentation and analysis are often based on idealized models, rather than on how users actually behave. Minit visualizes accurate 'as-is process' in terms of design, variations, and patterns, in addition to calculating process performance information by simply pushing a button. Traditional business process modelling is a costly and time-consuming process. It can be easily influenced by subjective opinions, lack of knowledge or objective validation techniques. Minit Process Mining overcomes these shortcomings. Minit automatically recreates process maps from traces of users actions left within the applications they use to accomplish tasks when they do their jobs. It provides an accurate picture of how users are performing their duties rather than the idealized model of what they are supposed to be doing. 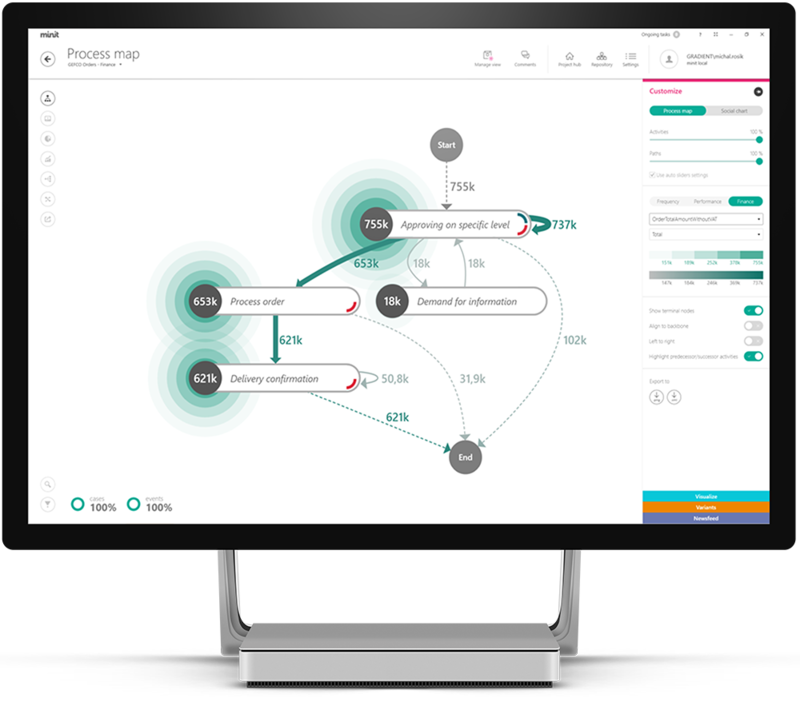 Unlike a static model, Minit can also provide an animation of the process flow over time, to allow analysts to understand the dynamics of the business processes. Making it much easier to improve the process and also to automate using a BPMS tool. Minit generates business process flow diagrams and statistical overlays for fast analysis of the time spent on individual business activities, ability to measure the cost or money flow for each process, the number of users that follow a particular path, and much more. Trying to discover and document existing “as-is” business processes is a time consuming and painful task. Minit starts from event logs (audit trails, transactions, databases etc. ), and discovers patterns to recreate a process model fitting the information obtained from the events. Identify who participates in the process and the systems in which it takes place. Extract event log data from the various IT system - ERP, CRM, Service Management, BPM, LOB, etc. Transform raw data into the right format, combine logs from different systems. Import data into Minit and get process model capturing what has happened in the real-life process. Business process discovery is about much more than modeling and notation. Instead of just the activities and workflow, focus on the full set of capabilities required to make everything work right.